Try out the new Painted Bunting account. In Feb 2018 we launched a redesign of our All About Birds species guide. The following is a rundown of the major changes. Mobile optimized: images, text, and layout automatically resize to fit the device you’re using. On phones, look for app-inspired navigation tabs at the bottom of the screen to take you from point to point. All-new images: Images are integral to understanding birds, so we put them front and center in the new design. We made the images larger for more detail, and we’re using an entirely new set of photos (more than 7,500) curated by experts at our Macaulay Library. How do you tell a female Painted Bunting from female Indigo? With the new species comparison tool, we give you side-by-side views and specific ID tips. Try it out. Similar species compare tool: Narrowing down an ID? Dive into our compare tool for side-by-side comparisons of similar species. Each species has a hand-picked set of similar species photos, and each photo has a caption that tells you exactly what to look for to distinguish species A from species B. It’s a feature that doesn’t appear in any other species guide. Links to more images and sounds from the Macaulay Library archive: In case you don’t find quite what you’re looking for in our species account, you can click through to more images and sounds. Each link takes you to a ready-made search results page that displays the highest-rated images or sounds for the species you’re on (more about rating of Macaulay assets). More maps: The new site offers both static range maps for North America and zoomable eBird maps for the world. Try it out. eBird sightings maps: In addition to range maps for North America (via Birds of North America), you can click over to zoomable eBird maps and explore a species’ worldwide range. See the maps tab for Painted Bunting. Videos appear alongside images: one tab that no longer exists on the site is the Video tab—and that’s because we now intersperse Macaulay Library videos alongside photos so you can watch how a bird forages or flies, or hear it call, as easily as studying a still photo. And coming soon: Merlin Bird ID for the Web. Our popular free smartphone app, Merlin, will soon be available from our website as well. Merlin asks you five simple questions and gives you a short list of likely species—so you can use this feature to ID the bird, find its species account, and learn more about it. 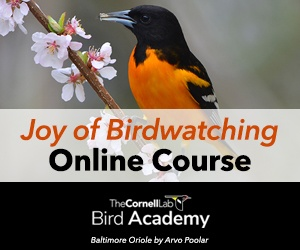 Please send us comments, criticisms, bugs, broken links, and any other notes by leaving us a public comment on this post or by emailing us at cornellbirds@cornell.edu.